we were attending a family wedding-ceremony and reception- at the resort- arrived day before and stayed extra day afterwards. Thoroughly enjoyed the whole stay . Beautiful location. quiet, relaxing . Apartment excellent. dining room facilities very good. Food exceptional! Dear Leonie, We very much appreciate your comments regarding your stay at the Novotel Lake Crackenback Resort & Spa. It is always a pleasure to receive positive feedback. I will share your comments with our team. I am sure that this feedback will serve as an encouragement to all of our staff as we strive to continuously improve the quality of our services. Thank you again for sharing your experience, and we hope your next visit will be as pleasant as the previous one. See you again soon! Sincerely, Alicia and The Reception Team. We alway have a good time. My young children enjoy the pool and the beach. (The pool may need to be cleaned more regularly) the new play ground is great. They were excited to watch the second slide get put it. When it was time to go home, my children were very mad at me! They wanted to stay longer My young son just received his Wally letter. Thanks he love it!! Dear Lance, We very much appreciate your comments regarding your stay at the Novotel Lake Crackenback Resort & Spa. It is always a pleasure to receive positive feedback. I will share your comments with our team. My apologies about not receiving your drink vouchers. Please keep this email, and on your next stay with us, we will be sure to pass on a couple of extra vouchers for you. Thank you again for sharing your experience, and we hope your next visit will be as pleasant as the previous one. Sincerely, The Lake Crackenback Team. The new Reception location is a vast improvement on what used to be and, as always, the check-in (and check-out) process was smooth & speedy. However, parking to attend to the check-out process is tedious. As always, the Apartment fully met expectations (except there was no breadknife). The Christmas Lunch was again superb, with a fantastic range of fare to suit all tastes. The only (tiny) negative was that the firewood was in lumps that were too big to readily catch fire; also, it was of a type that doesn't burn well anyway. We had an amazing family holiday. We loved your mountain bike trails and skills courses - these were great for our kids first mountain biking experience. Beauty, serenity and activities galore, this resort has it all! Loved it, as always. Plenty to do and plenty of ways to relax. There is only two things about the resort I would change. First up, the fitness centre and pool, why does 8am need to chime before it opens. With 2 young kids, the only chance I have for the gym and a swim is 6am. Second up, the breakfast buffet. I am a repeat visitor and look forward to every return, except for the plain and boring Helga's bread from the buffet. YUK! Anything would be better, or even just variety! Otherwise, great resort, friendly staff, keep it up. The best place to unwind alongside nature. 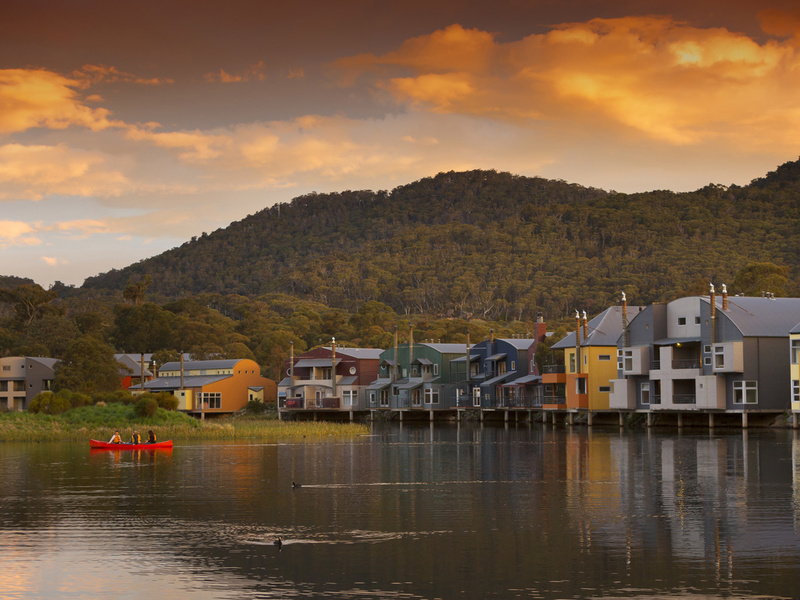 For the last 10 years we have spent time at Lake Crackenback and it is the perfect place to relax and go for many of the lovely walks or even the bike trails. The surroundings are amazing. The staff are awesome and the food is excellent. As usual Lake Crackenback resort does not disappoint. Lots of opportunities to do as much or as little as possible. Our family did some walks, swimming and mountain biking as well as some deserved R&R. Amazingly beautiful part of the world. As usual Lake Crackenback delivers beyond expectations. The ease and use of the courtesy bus to the ski tube was fabulous. The staff at the Lader Cafe were lovely. The Checkin/out staff were very helpful at all times. Just wish there were drawers in U40 Main Bedroom and Loft Area would make for a tidier holiday. As always we enjoyed a relaxing time staying at Lake Crackenback Resort although were disappointed the Cuisine restaurant was not open during our stay and also the bar was not operational either. The main reason we stay at Lake Crackenback is that we don't have to leave the resort to wine & dine and this was not the case this time. We did dine at Alpine Larder twice but also went out to Jindabyne twice. Our expectation was the full resort facilities would be available! This was our 12th visit to this resort. We love the location. We stayed in a 2 bedroom Lakeside apartment. I was a bit disappointed that we did not have one of the units that sit over the lake. This unit, no. 28, had a section of grass in front of it before the lake. We have stayed in nicer apartments. This one had a very low and uncomfortable lounge. I think it needed replaceing. There were alot of things missing from the kitchen, so it made self catering a couple of our meals interesting. In each of the bathrooms, there was only one facewasher, there should have been another 2, one for each person. Apart from these few things, the apartment was very clean. The underfloor heating in the bathrooms was great! The beds were comfortable and the scenery is beautiful! We were there for a week of skiing and the snow was brilliant. The team at Harro's ski centre are wonderful! They make sure you have the correct fitting ski boots and skis and any other snow equipment you might need. Nothing is a problem and they go out of their way to help you. We ate at the Cuisine Restaurant on 2 occassions and the food was outstanding! We also had 2 meals at the Alpine Larder Cafe and they were lovley too. The breakfast, could be improved. It was exactly the same thing everyday. There were slight changes in the fruit and pastries. They used to serve a lovely muesli. This year it was a GF one and it was very bland. Some mornings the food and cutlery replenishment was very slow. The highlight for me, was seeing the Platypus in the lake. We could see them from our room and on walks around the lake at dusk. Lovely seeing them in their natural habitat. This was the first time we had experience with inconsiderate neighbours. Our unit was on the ground floor and we had people in the unit above us. They had children that got up early and thumped around upstairs and up and down the outside stairs, which are metal. One morning, before 7 am, we could hear children talking loudly, yelling and arguing, what seemed like right outside our bedroom. I got up and discovered that they were outside our bedroom and on the verandah of our unit with a pile of bread and lots of ducks. They were feeding the ducks. I told them to be quiet as people were trying to sleep and to please move away from the verandah. They did become quiet after that. It is a lovely place to stay. Dissapointing for the price we pay. Quality of servise is always good. No complaints at all. Quality of accomodation is poor. Only 2-3 apartments out of 48 meet the standards. The rest is too old and in desperate need of renovation. The restaurant is a different story.... It just hit the new low. Breakfast is absolutely revolting. Despite numerous complaints, nothing has been done to improve. Novotel doesn't give us a choice. It charges upfront, $25 per person, for this dog food. The quality has dropped 3 years ago (out of 7 years we spent in Lake Crackenback resort). Prices go up every year. Quality goes down. What happened to this place?! Lovely, stunning location beautiful apartment and great food. Restaurant staff super friendly. Felt a little bit rulsey, we couldn’t check in till right on 3.00pm, we were there at 2.55pm. We missed the shuttle back and were going to be charged $25.00 to get a pick up, considering it is a five min drive it seems excessive, if they had picked us up I would be raving about the service so something to think about. .
We reported the annoying squeak in the chimney only to be told that it had already been reported to ACCOR & they were waiting on an approval to rectify, this squeak went all week every day & night, needless to say not many of us received a good nights sleep. The cleaning of the apartment needs to be improved on, my grandson pulled biscuits from under the lounge, there was makeup still in the sink in the bathroom upstairs and I just hate finding other people's hair still left behind. One of the beds did not even have an underlay on it. There were not enough pots to cook with, we had to ask for more. There was no carpet sweeper to run over the floor. There was very minimal cleaning supplies as we stayed for a full week & had to ask for more. The washing powder is nothing but crap it just goes into a hard lump still sitting in the dispenser & doesn't even go into the washing machine. The seating that is attached to the kitchen bench is only suitable for children to sit at, as when adults sit there it looks like it is going to break, we did report this and a guy came and looked at it, I told him it needed some bracing to the floor, it looks like it has already broken and just been screwed back on in a different place, said he'd return but never did. Disappointed that the beds weren't as comfortable as on previous occasions I am sure that there used to be beautiful plush underlays on the beds, the queen size bed in the main room had a mattress protector that didn't even fit the bed. The sheets didn't even seem to be the correct size. There is no shelving in the main bedroom wardrobe, only hanging space. The chairs in the lounge room (2) are the most hideous uncomfortable things to sit on & whoever was given the job to pick these out needs to sit on them and try and watch a movie because I can guarantee they will not last 30 minutes sitting there, get rid of them and put in something more comfortable, after all isn't the motto 'Relax'. Also there was no kindling (that's small pieces of wood for you city folk) to start the fire with when it went out, try starting a fire with those firelighters using the chunks of wood supplied, in the end I gave up & just left a heater on.